The Barcelona–El Prat Airport is about half an hour away from the city centre, but there are several options that you can use to get from the airport to Barcelona, such as a taxi or the train. 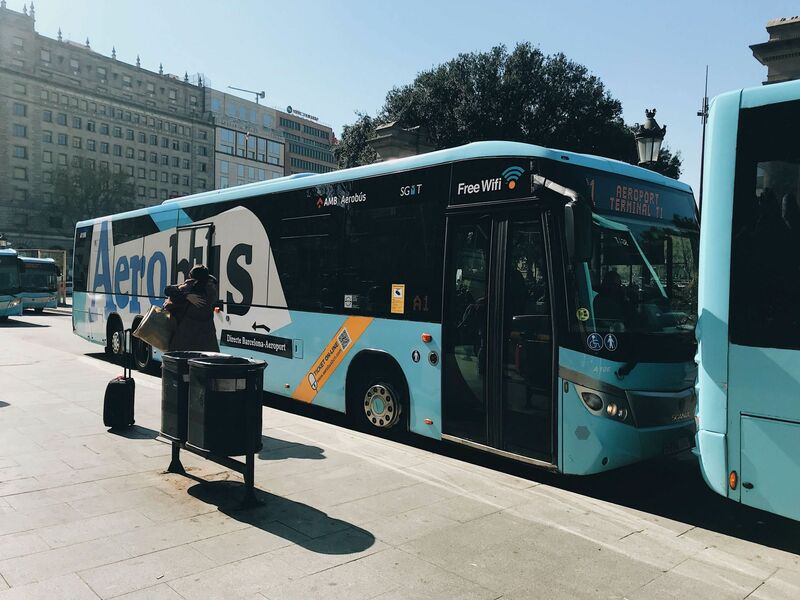 However, by far the most convenient is the Aerobus, which leaves every 10 minutes from both terminals 1&2, and takes you directly to the city, stopping at several key points along the way. You can read more about the AreoBus here. Note tickets only cost €5.90 (€10,20 for a return). Barcelona is a HUGE city and its popular attractions are spread out amongst several districts/neighbourhoods. More so, each of these neighbourhoods has something different to offer visitors, making it difficult to choose where to stay! As I only had time to spend 2 days Barcelona, I wanted to be as centrally located as possible! Therefore, I opted to stay in the Eixample Region. Home to iconic Sagrada Familia and other Gaudi masterpieces, this district is also close to the cities historic Gothic Quarter, and it has excellent public transport connections to the rest of Barcelona. My hotel: Granados 83 was simply beautiful! Its rustic industrial style provided a unique experience. The hotel staff were super friendly and always happy to help. What’s more, my room was large, spotlessly clean, and came with a glorious bath (which was amazing to use after long days of exploring). My stay only cost about €150 for two nights, which for the centre of Barcelona is pretty affordable! If you want to learn more about the pros/cons of each Barcelona district, check out this helpful post. As I mentioned, Barcelona is not really a ‘walkable’ city. I found that some key attractions can be at least a 30-40 minute walk apart. Therefore, if you’re visiting Barcelona in 2 days, you’ll want to invest in the T-10 public transport ticket (which you can use on both the Metro and City Busses). As the name suggests this ticket gives you 10 journeys and only costs €10.20. I fully utilised this card during my time in the city and found that 10 rides is all you’ll need for 2 days. After taking the Aerobus into the city centre and reaching my hotel, I quickly dropped my bags off and headed out to explore the local area. 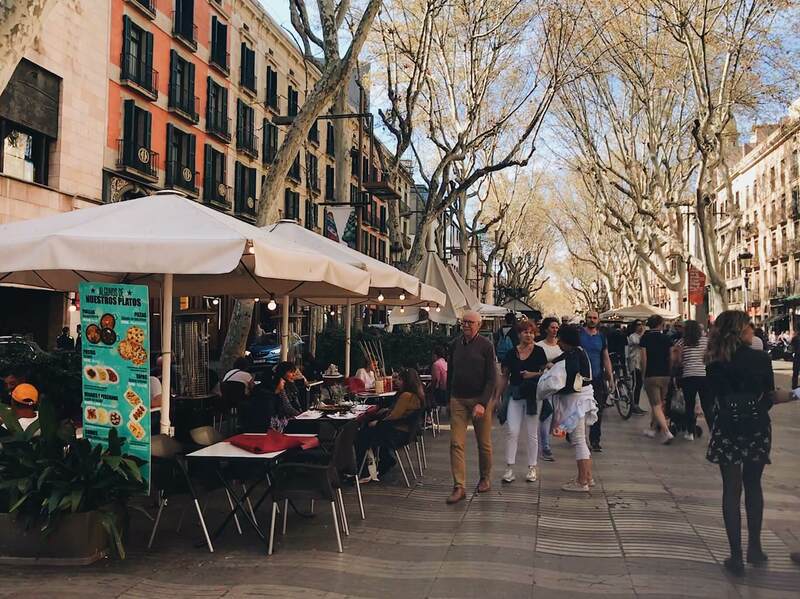 Eixample is home to many of Barcelona’s famous shopping streets: such as Passeig de Gracia. Here you can window shop at many famous brands such as Chanel and Louis Vuitton. 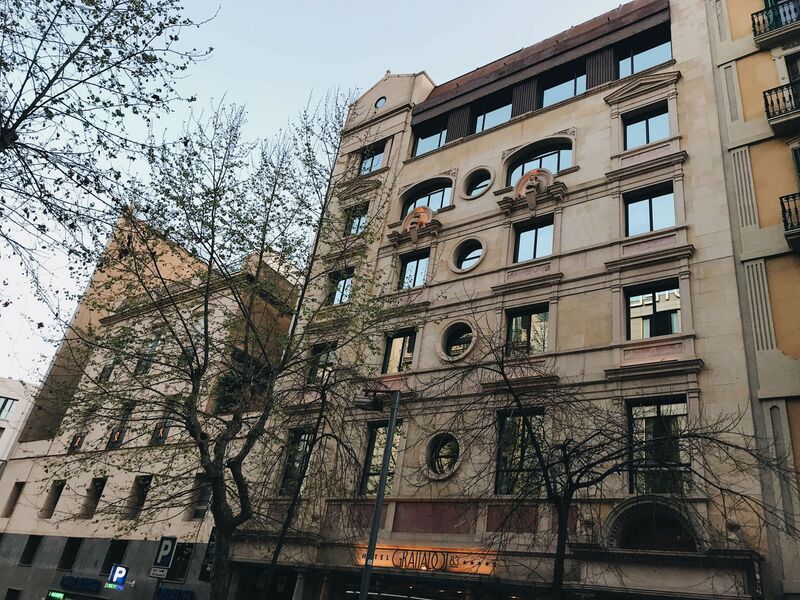 Along this street, you’ll also find the iconic Casa Batlló, which is just one of the many beautiful buildings in the city designed by the famous Architect: Antoni Gaudi (who is a sort of patron saint of Barcelona’s Architecture). 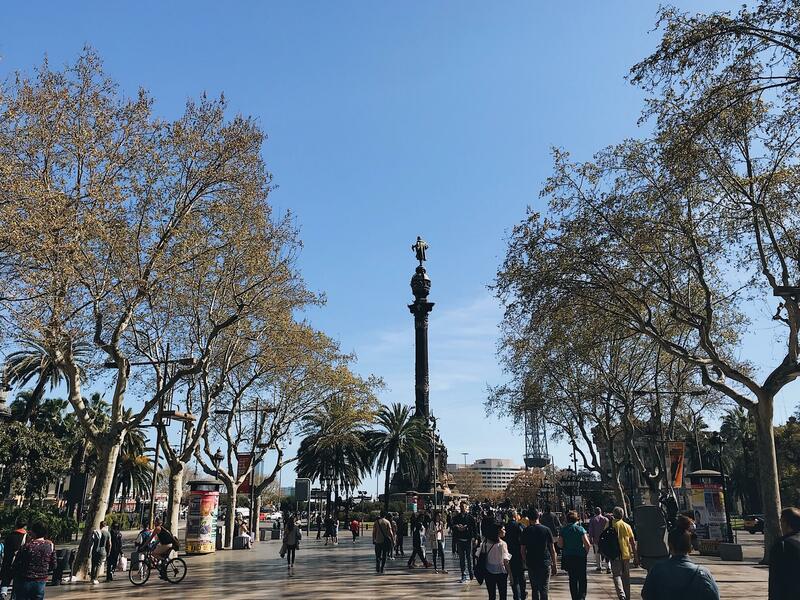 Close by is the iconic Las Ramblas street, a 1.2km long promenade that connects Plaça Catalunya with the Christopher Columbus Monument at Port Vell. During my trip, I took the L3 Metro line to the Drassanes stop, which is located right next to the Columbus Monument. Built in honour of Columbus’ first voyage to the Americas, the monument serves as a reminder that Queen Isabella I of Spain funded the famous explorers’ voyage to the ‘new world’. The impressive structure stands at 60m tall, and is elaborately decorated, making it a fantastic site to visit! After taking in the Columbus Monument, I wandered down to Port Vell. I don’t hear many people talking about this beautiful harbour area of the city, but I absolutely loved it. 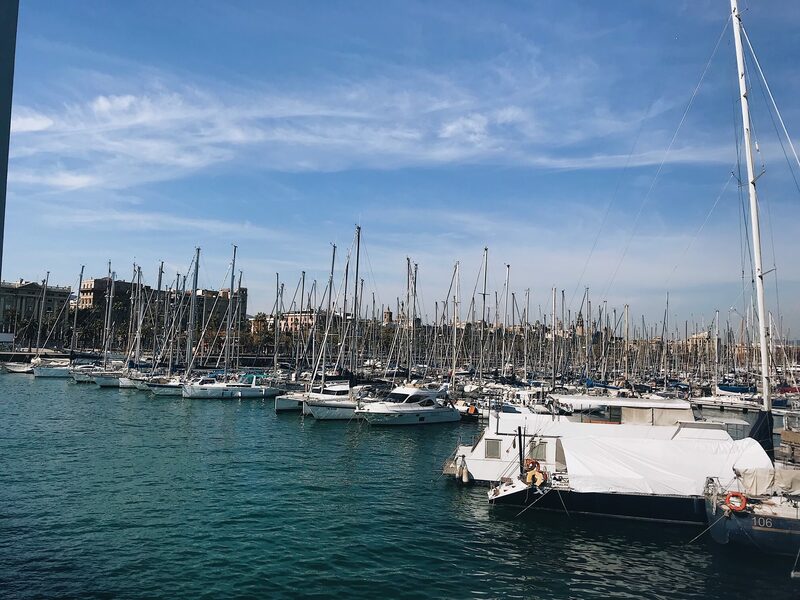 Port Vell is the perfect place to relax, especially since it can be difficult to squeeze in a visit to the beach during a short Barcelona Getaway, as it’s quite far away from the centre of the city. Port Vell, on the other hand, is meters away from the heart of Barcelona. 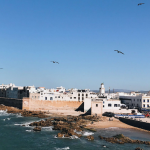 In this way, a visit allows you to explore the seafront and enjoy ‘beach vibes’, without wasting valuable time travelling to the edge of the city. Thus, I would highly suggest visiting during your Barcelona Weekend. During the afternoon of my first day in Barcelona, I decided to book a free walking tour of the Gothic Quarter. Comprising of enchanting squares and mysterious alleyways, the Gothic Quarter is the heart of the old city, making it (in my opinion) one of the most interesting places to visit in Barcelona. 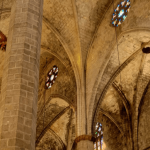 Interested in visiting Barcelona’s Gothic Quarter? Read my top 10 things to do! I booked an afternoon tour with Runner Bean Tours, and would highly recommend them for your own Barcelona weekend, as my guide (Anne-Marie) was very friendly, funny and knowledgeable. 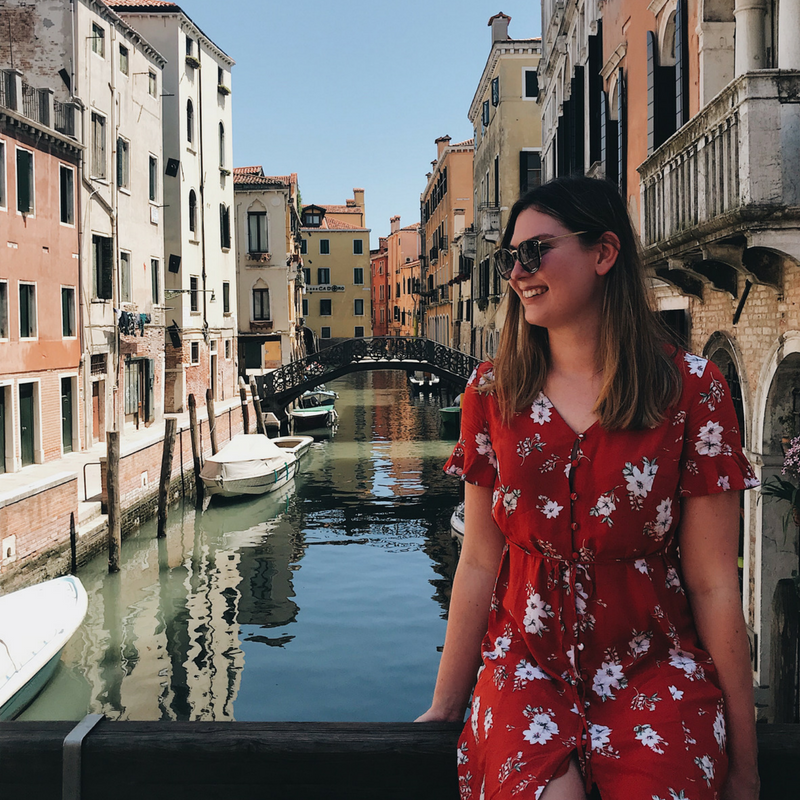 I always find that such walking tours are a great way to explore a new city (especially when you have limited time), as guides take you to places you’d never find if you decided to visit on your own! 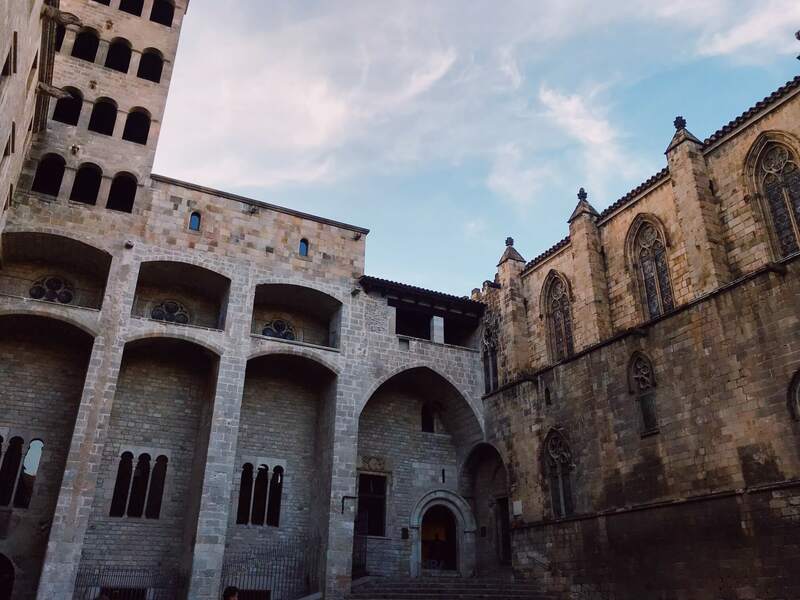 For example, my tour took me to the ancient royal palace at Plaça del Rei. 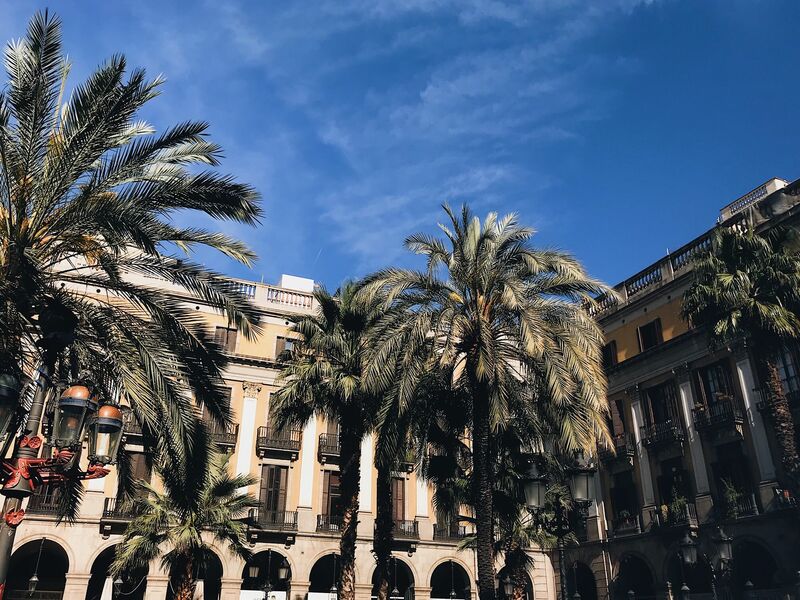 Other highlights to note in the gothic quarter, if you planning on touring them for yourself, include: Plaça Reial, an elegant square located off of Las Ramblas street, and the stunning Barcelona Cathedral. Often overshadowed by the Sagrada Familia, the cathedral is a great example of 14th-century Neo-Gothic Architecture. 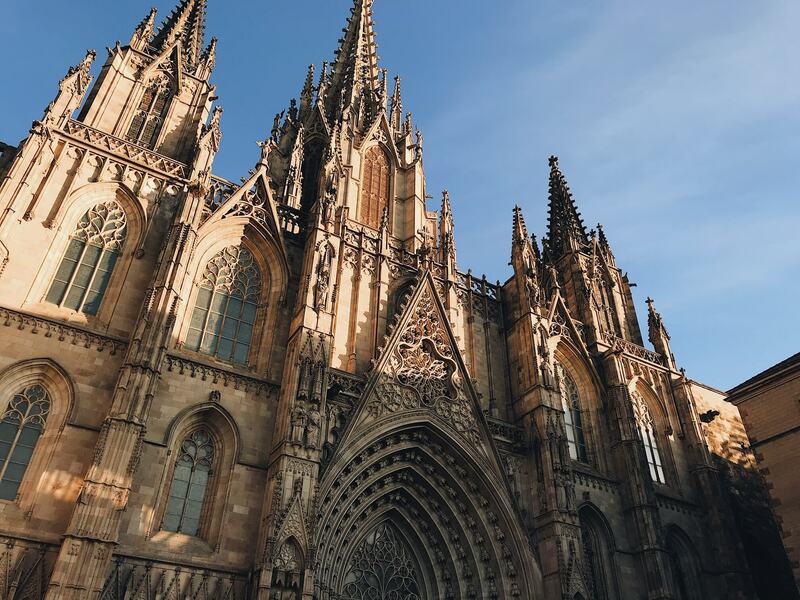 During your 2 days in Barcelona, the Cathedral is a must! 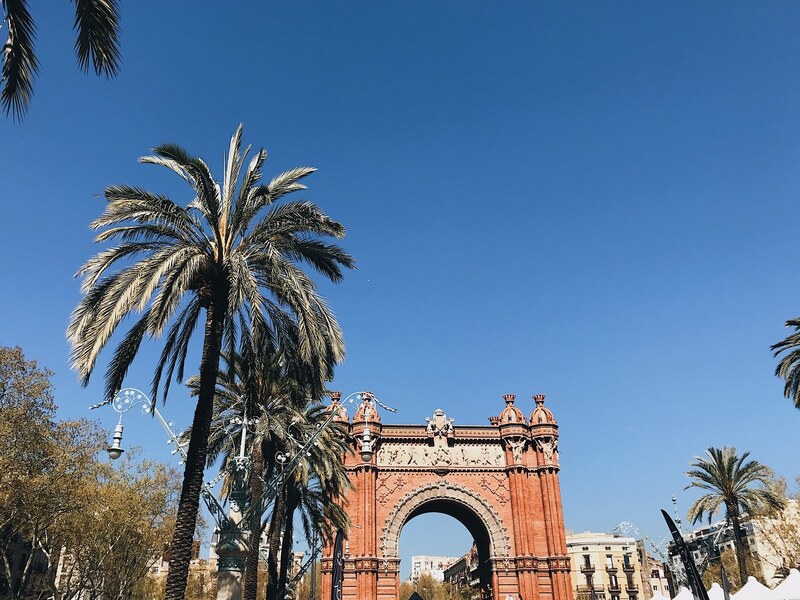 After a busy first day in Barcelona, I began my second with a leisurely breakfast, before taking the tube out of the city centre to visit the Arc De Triomf, which was built in 1888 when Barcelona hosted the Universal Exhibition in the nearby Parc de la Ciutadella. The Arc served as the gateway to the exhibition and it still marks the start of a graceful path/road that leads to the park today. TOP TIP: The Arc De Triomf has its own tube stop on the cities red line (L1), making it super easy to travel to. I followed this path into the Parc de la Ciutadella, which is definitely one of the city’s most relaxing and picturesque spots. 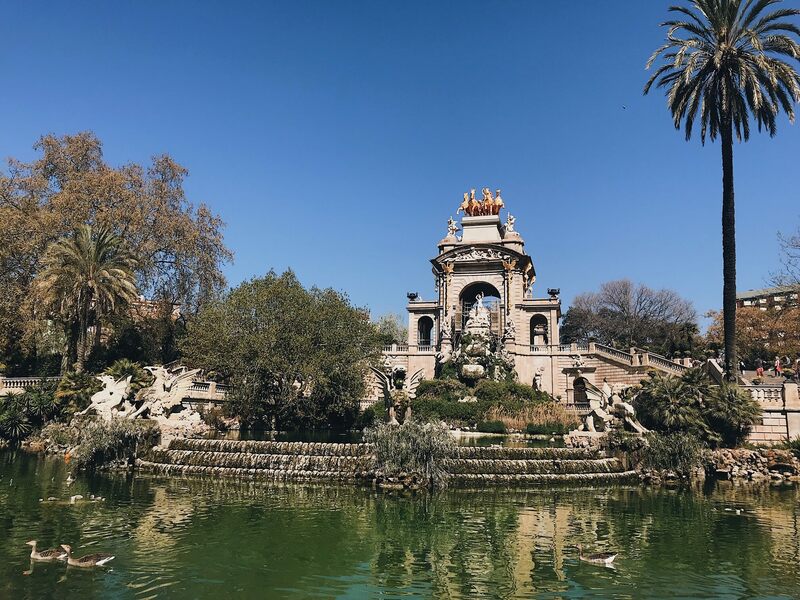 The park is home to several attractions such as the Barcelona zoo, however, I visited the Cascada Monumental, an epic fountain which is like something out of a Disney movie. The park was one of my favourite places that I visited during my 2 days in Barcelona! Especially since I visited on a Sunday, meaning the peaceful green space was filled with families and locals enjoying the first of the warm spring weather! 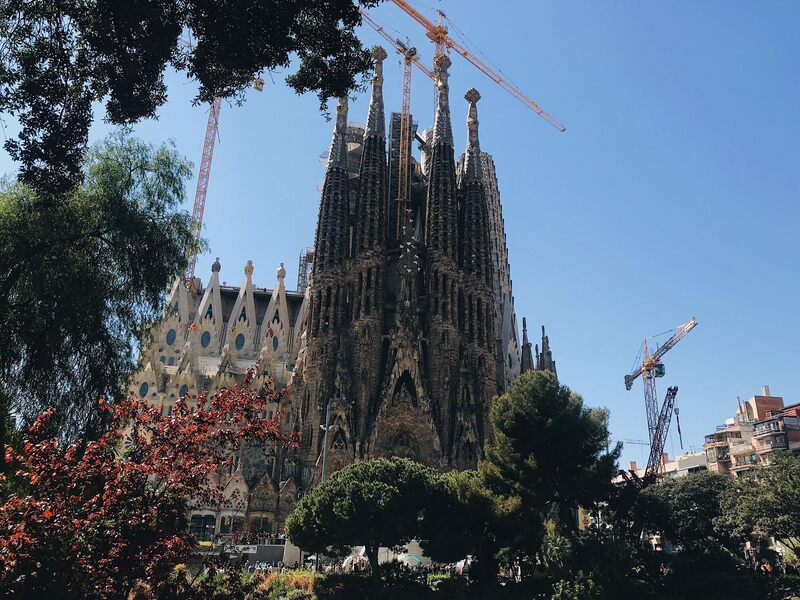 Sadly I couldn’t spend too much time relaxing in the park, because I’d pre-booked a ticket to possibly the cities most famous attraction: the Sagrada Familia. 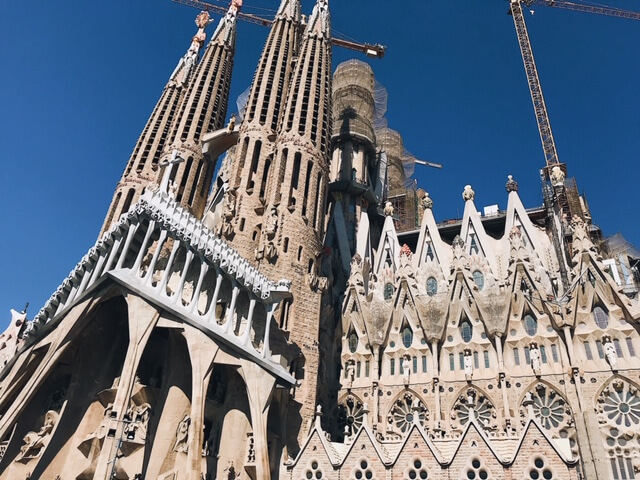 TOP TIP: If you want to go inside the Sagrada Familia (and I highly suggest that you do) you should pre-book your tickets online in advance. By doing so, you can select a timed slot that suits your itinerary, and it allows you to skip the long queues for a ticket on the day. I took the time to admire the Sagrada Familia from all sides, as each is completely different and breathtakingly beautiful! The best views I found of the ‘nativity facade’ (the oldest section of the church) was from the Placa de Gaudí, a small park opposite the Familia. This is by no means a hidden secret as the park was filled with people, but I did manage to find a free bench where I could take a minute to sit and take in the sheer scale of the building. FUN FACT: The Sagrada Familia is still being built (hence the cranes) despite the first stone being placed in 1866. It’s scheduled completion date is 2026, which means it will have taken longer to build than the Great Pyramids in Eygpt, and almost as long as the Great Wall of China. I spent a good 2 hours touring the Sagrada Familia, and the connecting museum. I then stopped nearby for some much-needed lunch, before getting back on the tube to head to Park Güell (another Gaudí masterpiece). The park is located right on the edge of Barcelona, on Carmel Hill, meaning the walk from the Metro Station is essentially straight up! TOP TIP: the nearest metro station to Park Güell is Vallcarca on the Green Line (L3). 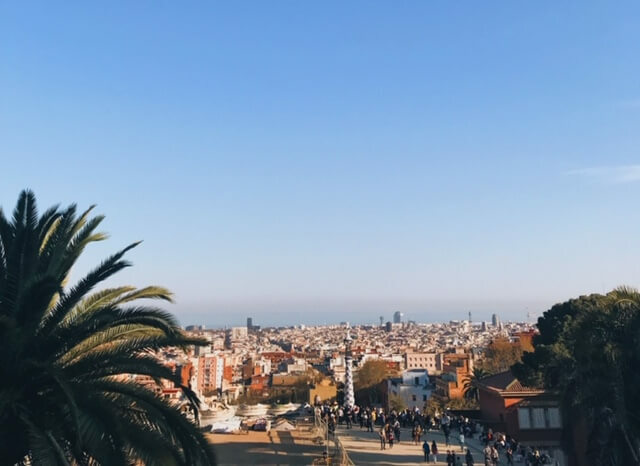 Despite being far away from other Barcelona attractions, I’d say a trip to Park Güell is another thing you simply have to do, even if you’re only seeing Barcelona in two days. The views from the park, and its amazing design, more than makes up for the time it takes to get there! FUN FACT: The park was actually meant to be a high-class residential neighbourhood overlooking Barcelona. But, luckily for us, the cities wealthy residents didn’t share Gaudi’s and Eusebi Güell’s (who commissioned the work) vision. The project was a commercial failure, so only the park was ever built. One can only imagine how stunning the whole neighbourhood would have been if it had been completed! 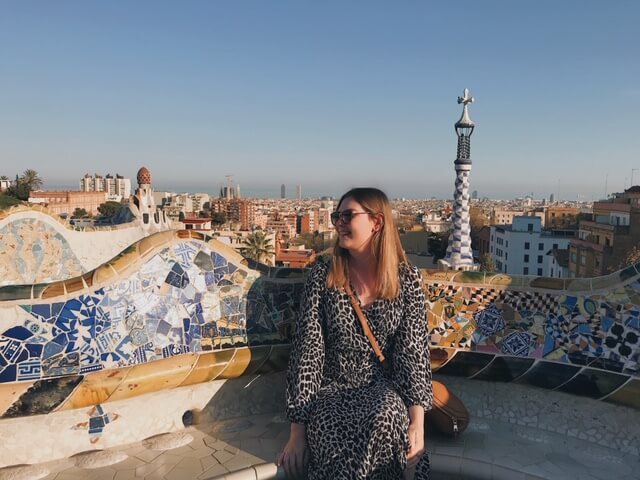 Park Güell was one of the busiest attractions I visited in Barcelona, so make sure you prebook a ticket (Which you can do here). Similarly to the Sagrada Familia, you can select a timed slot to enter the park. I chose to go at 6pm, as this allowed me to watch the sunset over Barcelona from the Parks hilltop vantage point, which was simply magical! So that completes my guide on what to do for 2 days in Barcelona. There are so many more sites in the city which I would have loved to have seen, such as the Sagrat Cor church, Montjuïc and Barceloneta (the cities beach region). However, I definitely made the most of my weekend in Barcelona and loved every minute of my time in the city. Ah I love Barcelona! This is such a great guide. The gothic quarter is one of the most unique and stunning places. The architecture in Barcelona is incredible! Totally agree with you, I loved the Gothic Quarter! It just has such a unique vibe, and it’s totally different from the rest of the city which felt very modern to me. It’s the perfect place to visit for a short city/weekend break that’s for sure! My sister recently went to Barcelona and mentioned a lot of the same things and one of the things she liked was how convenient their transportation was. The Aerobus is so convenient and it’s great that it runs every 10 minutes. The public transport was probably one of the best systems I’ve used in Europe! And it’s always nice to have such a convenient way to get to and from the airport. What a wonderful weekend trip! Who else wouldn’t want to explore this beautiful city for a couple of days? I love the Parc de la Ciutadella, it looks so picturesque! I think Barcelona is the perfect place to escape for a weekend, especially from elsewhere in Europe. It’s relatively cheap, loads to do and great food. Love your photos too. You fit a lot into 2 days! 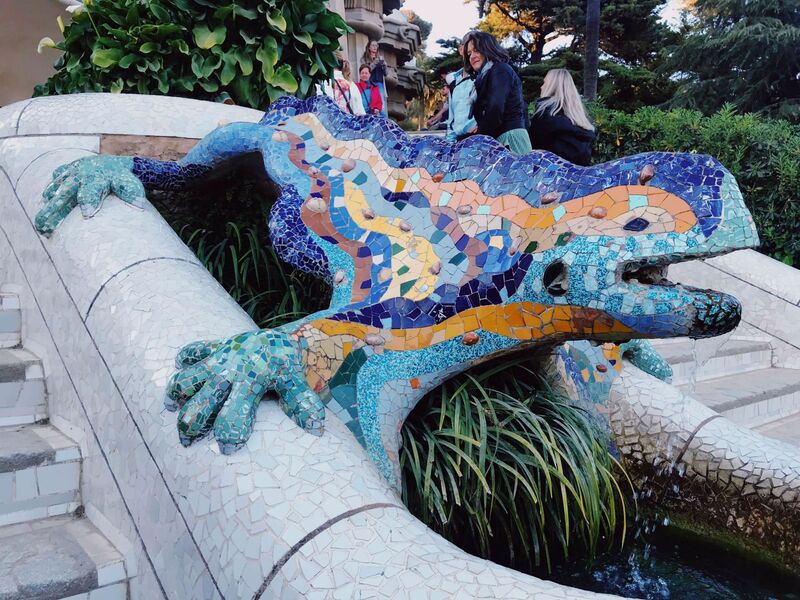 My favorite thing in Barcelona was Park Guell so glad you made it there. I am going to make a note of your hotel for my next trip. It sounds ideal and such a reasonable price! It was quite a busy weekend haha! The hotel was lovely so I’d definitely recommend it for your next trip! Great tips + WOW those buildings are absolutely stunning. I wish that i lived in Europe because there are so many neat cities that you can explore for the weekend. Great guide! It is crazy how you can pop to a completely different country that’s for sure! Aaah Barcelona! I always hear about this gorgeous city but I still haven’t visited yet! I didn’t think you could fit so many activities in two days, that’s great to know! Barcelona’s Cathedral is really stunning! This is a great guide to one of my favorite cities. I’m planning a trip back and didn’t know about Port Vell. Will definitively check out this little gem. The architecture is stunning and it is a beautiful city to explore. That’s great that you are close enough to make a quick weekend jaunt.